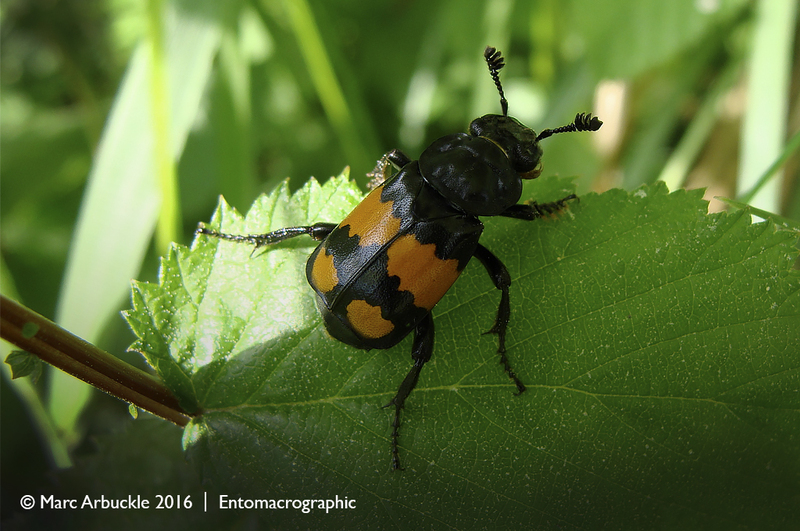 While sorting through some old photos from 2008 I discovered this photo of a burying or Sexton Beetle Nicrophorus vespilloides. These are useful beetles that bury the carcasses of small vertebrates such as birds and rodents as a food source for their larvae. These beetles sometimes called carrion beetles belong to the family Silphidae. This one landed on this stinging nettle no doubt alerted to the presence of a nearby carcass by the chemoreceptors on its club-like antennae which enable it to detect the whiff of the recently deceased from a very long distance indeed. Once the carcass has been located the beetle will begin to bury it by excavating a hole beneath. This is a strategy to get it out of the way of potential competitors, of which there will be many. It also plays its part in keeping the countryside from being knee-deep in dead rodents. Next it removes the feathers or fur to line and reinforce the crypt and then covers the body with antibacterial and anti fungal secretions which help to slow the decay and mask the scent. The female then lays her eggs in the soil next to the underground chamber. After a few days the larvae hatch and move into a pit within the carcass which the parents have previously created. Although the offspring are quite able to feed themselves both parents will feed the larvae additional flesh to speed up development. However, if the carcass is small the parents will cull some of the young to ensure there is enough food for the majority to reach adulthood. Parental care of this type is quite rare among insects. As an aside if you pick up one of these insects and have a quick sniff (yes I know I need to get out more) you will find that the stink is unbelievable, quite literally the stench of death. Needless to say if curiosity gets the better of you and you give it a try don’t forget to wash your hands afterwards. It may take several attempts with some strong soap before you get rid of the smell.